They’re known for creating the classic gameday atmosphere and the singing of the national anthem before tip-offs and kickoffs, but their expertise doesn’t stop there. 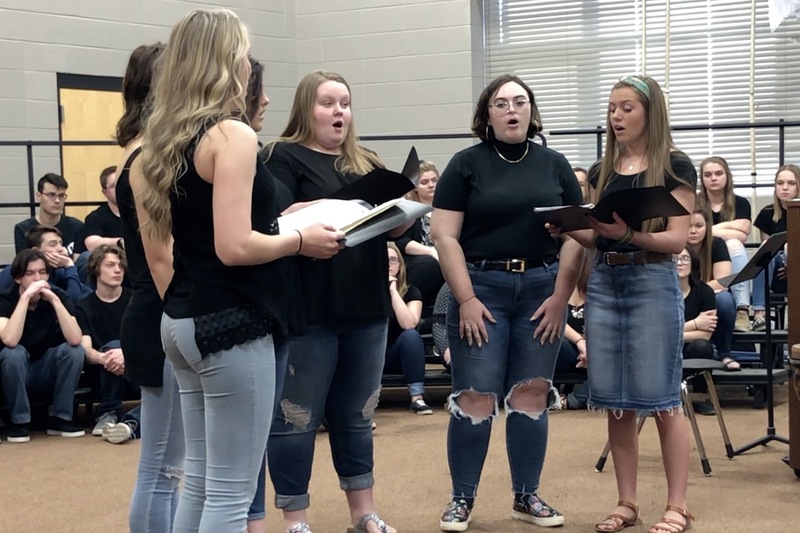 This week, we take a look at the recent accomplishments of the music programs at Republic High School. On April 27 & 28, Republic’s band and choir sent a combined 90 students to compete against all other qualifying schools at the Missouri State Chorale and Band Competition held in Columbia on the University of Missouri campus. All students first had to qualify by earning a 1 [gold] rating on their performances at districts in order to compete at State. Junior Jade Callahan qualified for three pieces she prepared for band. Of those who went on to compete at State, 22 members were awarded a 1-rating for either a solo or ensemble, including Callahan’s solo and saxophone sextet. “I was really surprised when we got the results, but I couldn’t be happier,” she says. Republic’s Choir raised the bar by having a record high number of students qualify for the state competition — 58 earned 1 ratings at districts. Their accomplishments didn’t stop there — the program ended up with 25 students bringing home at least one superior rating [gold medal] in a solo/ensemble performance. Senior Ashton Lairmore was one of those students.